And majority of the time end up either not eating breakfast or stopping on the way to work grabbing something kinda low carb-ish? I always have good intensions of jumping out of bed when my alarm goes off, getting into the perfect morning routine with plenty of time to cook two eggs, slice up half an avocado and enjoy a nice breakfast at my kitchen table before calmly heading out the door each morning. …yea that never happens! But if you prep breakfast before hand it makes the whole morning routine thing so much easier. 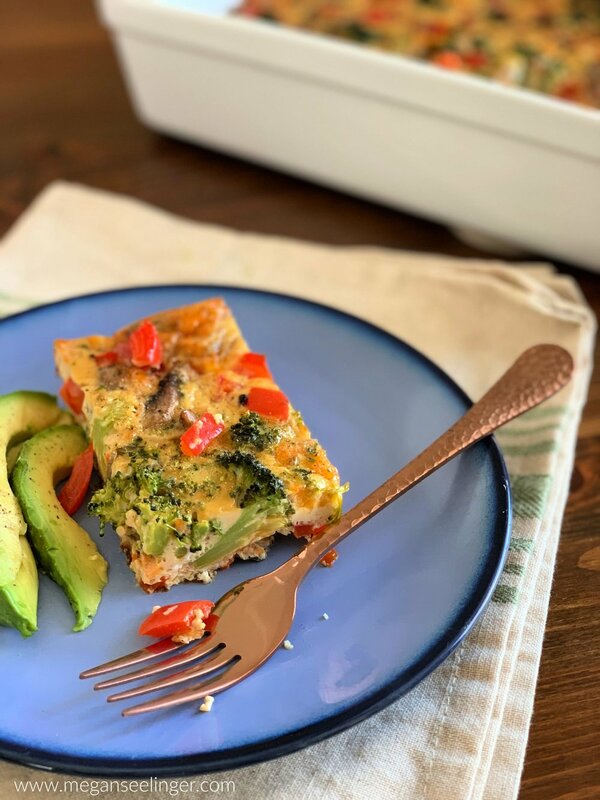 It also helps that this breakfast casserole is easy to make so it won’t totally ruin your lazy Sundays. First, you will want to sautéed the veggies in a large pan over medium heat. Add the avocado oil to the pan first then add the mushrooms, onions, garlic and cook for about 4 minutes or so. I turned the heat off and then added the peppers so they could slightly soften while I moved on to the next step. I think it tastes better when the peppers aren’t super soft. 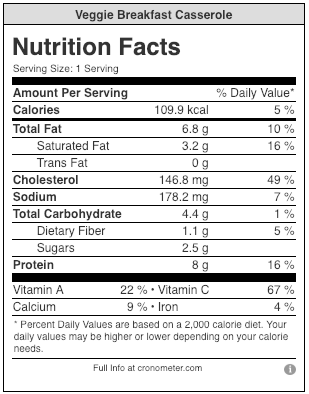 You can use different veggies or even add a meat like ham, bacon or sausage if you prefer too. Just make sure you cook the meat before baking the casserole. Next, add the eggs, heavy cream, hot sauce, salt, pepper and whisk it all together. Spary your 9 X 13 baking dish really, really good add the egg mixture, then half the veggies, half the shredded cheese, then the remaining half of the cheese and the remaining veggies. I like to layer it like this so the cheese is kind of spread throughout the casserole more. Last step is to bake the casserole for about 35 -40 minutes at 375 degrees. 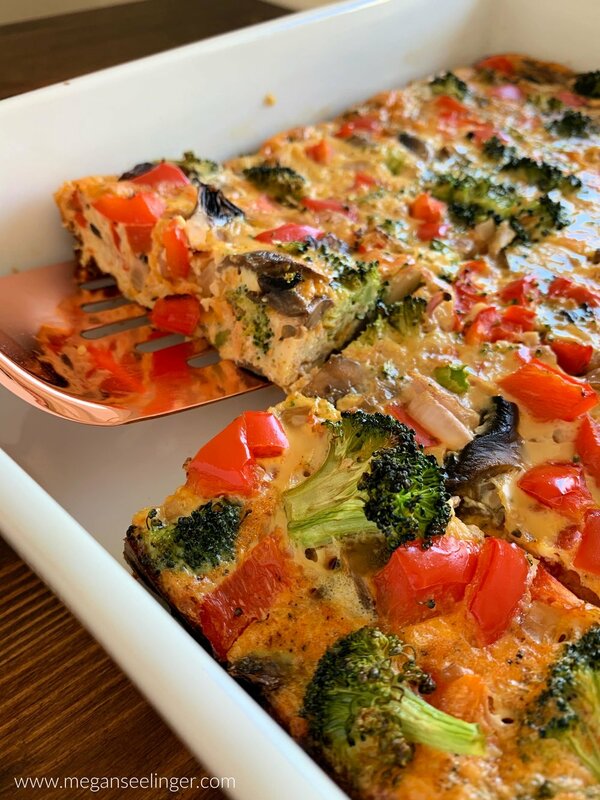 BAMN there you have it easy, veggie loaded, low carb, grab-n-go breakfast casserole! Add egg mixture to your 13 X 9 baking dish, add half of veggies, then the shredded cheese, then remaining half of veggies.